Mission: To encourage personal responsibility for community appearance through education, activities and recognitions. To reduce litter, promote recycling, preserve and beautify our neighborhoods, waterways and public spaces. 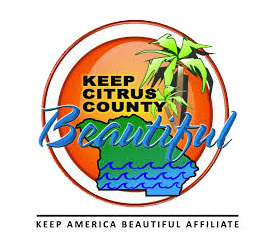 Who We Are: Keep Citrus County Beautiful Inc., (KCCB) is an affiliate of Keep America Beautiful and Keep Florida Beautiful. The group was incorporated in October 2001 and is comprised of a community volunteer board, with membership open to individuals, businesses, governments and organizations. Programs: KCCB programs include Snag 'N' Bag, Citrus County Recycles, Save Our Waters Week and Citrus County Cleanup-Greenup. Look under those tabs for more information. Opportunities: KCCB is a non-profit 501(c)(3) organization, looking for volunteers, members and sponsors. If you would like to become a member you can find an application on the Join Us/Donate tab. You will also find information on making a donation of money, time or in-kind items. Board Meetings: Board meetings are held 12:30 to 1:30pm on the third Monday of each month at the Lecanto Government Building, 2804 W. Marc Knighton Ct., Room 117, Lecanto, FL 34461. Office/Storage Location: 3260 E. Gulf to Lake Highway, Inverness 34453 (no mail).